The market has finally sold off in what looks like the start of a stronger correction. 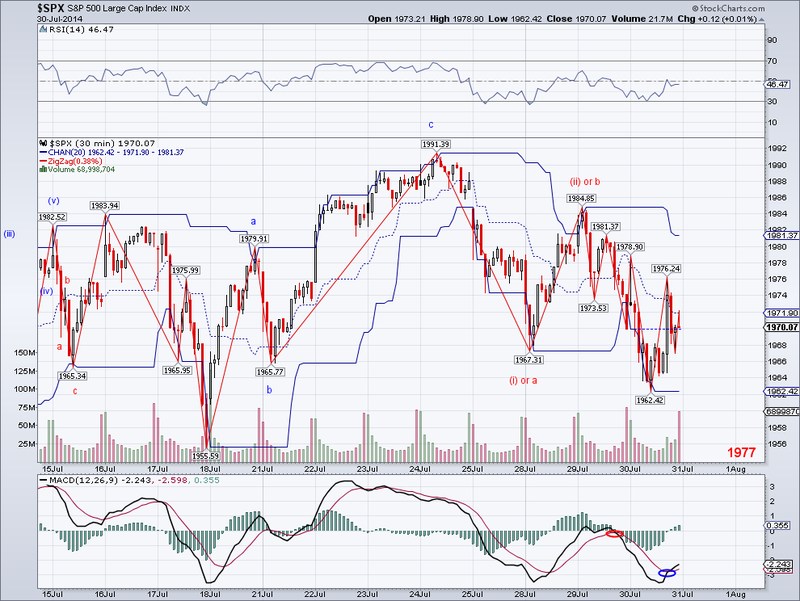 The wave today looks clearly like a W3 and further downside is likely. We might see a bounce tomorrow or Monday and the key levels to watch are 1955-1962, a counter rally can not go past these levels. Also, if the market fails to recapture its 50 DMA in the next few sessions, the Intermediate Trend will turn bearish as well and that will be confirmation of a multi-week or even multi-month correction. There were several headlines today that caused the sell off, but it's not really clear to me which one was the main reason. One thing I found odd is that safety assets sold off too, which usually doesn't happen during a stock market sell off. One of the reasons I am in Gold was because I expected a Gold rally once the market found a top, but so far it hasn't moved all that much so we'll see. Also, we issued our first ever short call yesterday on the new site we launched three months ago and it was very well timed. We are offering free trials, so feel free to check it out. 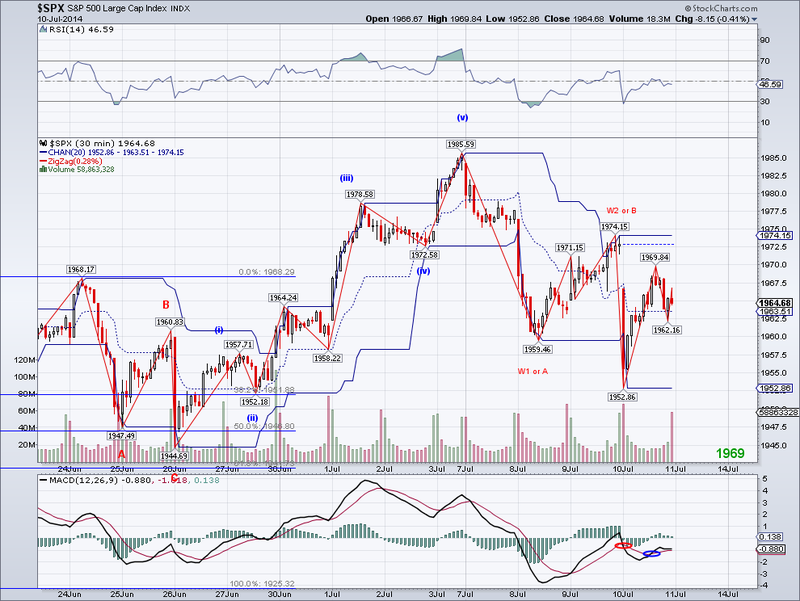 The market gapped up to test the TA but reversed to put in a lower low to close again below the Trend Average. So far, the bearish wave to 1962 looks like a C wave and unless we see strong selling tomorrow, we will probably see the all time high challenged again. The GDP number was very good, so fundamentally the reason to continue the rally is there. On the bearish side, we have Argentina defaulting on it's debt and perhaps that could be used as a reason for a sell off. However, this default is more of a dispute than an actual default, so in reality not much of a bearish event if you understand the situation behind it. Even when Argentina defaulted in 2001, everything was normal after a year or two. I was in Buenos Aires around that time and there were hardly any traces of any financial crisis, in fact, it was a great time to visit. The Trend Average has turned bearish with today's close and now we'll see if are going to get the correction so many people have been waiting for. The selling from today must continue tomorrow and break 1967, if not then there's a good possibility for a strong bullish wave to a new all time high as there's a zig zag from 1984 that could be counted as a W2. 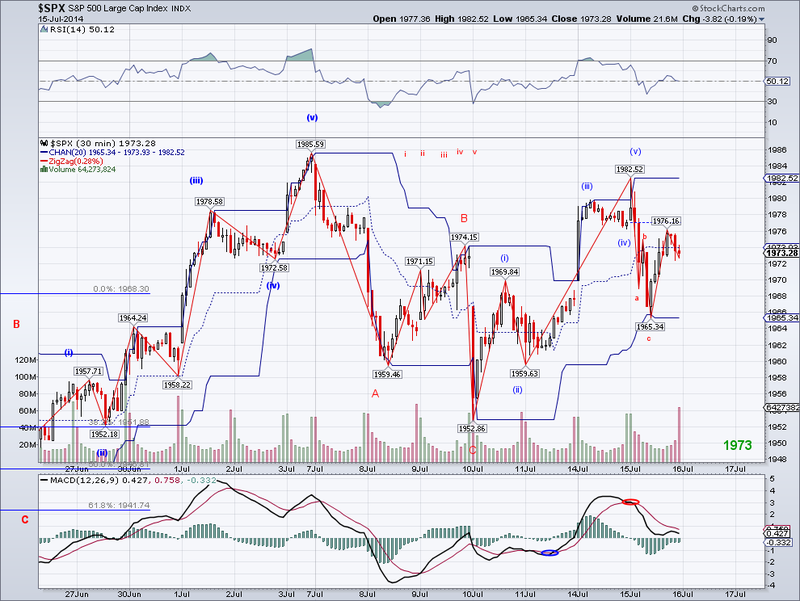 If key support breaks, specially 1955, there's a good chance we'll see 1800-1900 in August. I'm still holding Gold on my short term portfolio. The market had a bearish open but found support at the 1965 level and ended up the day closing right on the Trend Average and at resistance, so tomorrow we could see the start of a sell off if the market has indeed found some sort of top. If the market manages to break resistance, chances are the all time high will be challenged. There are headlines around calling for the start of a correction, which is needed for substantially higher highs to come. But with some markets breaking out, most notably China, any correction at this point will probably not retrace all that much. Maybe in the 5-10% range? Also, I wanted to add that I have not posted an Intermediate or Long Term count recently because waves are not very clear. 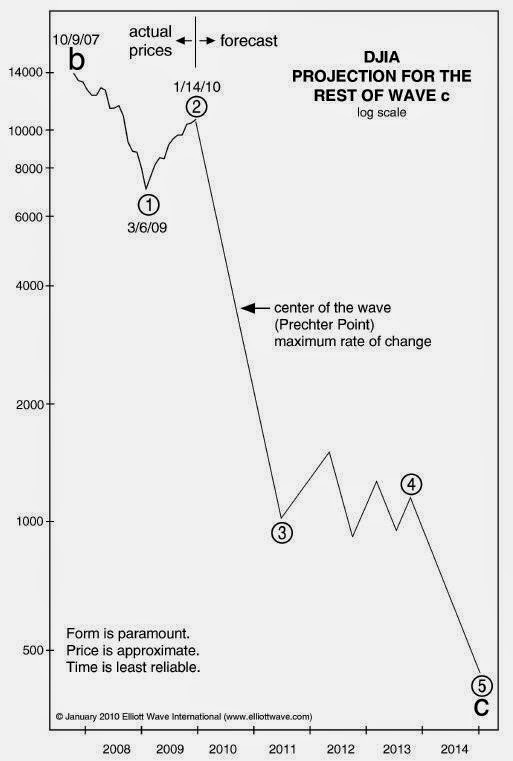 One could argue the market continues to be in a Primary 3rd wave or the final 5th wave of the structure that started in October 2011 at 1074. If you are fortunate enough to have been long since 2009. the best thing to do is follow the trend signals primarily and wave counts second. Long Term Elliott Wave counts can form a bias (specially if trend signals are ignored) that can be disastrous if you find yourself on the wrong side of the trend. To illustrate my point, just take a look at the infamous count from Elliott Wave International in 2010. Which at that point almost every single EW person was following and trading. Anyone who traded that Long Term count expecting the DOW to go to 400 this year got basically wiped out completely. However, if one takes the trend into account and puts aside all the personal biases as I did back then, the expectation and expected results could not have been further apart. The bullish micro 5 count failed today as the correction retreated below 1979.91, so it implies a good possibility of lower lows if the all time high does not get breached. One pattern I'd like to see is a Head and Shoulder's with 1955 being the left neckline (if 1991>1974 was W1, then I expect 1950-1955 on a bearish 5 count). 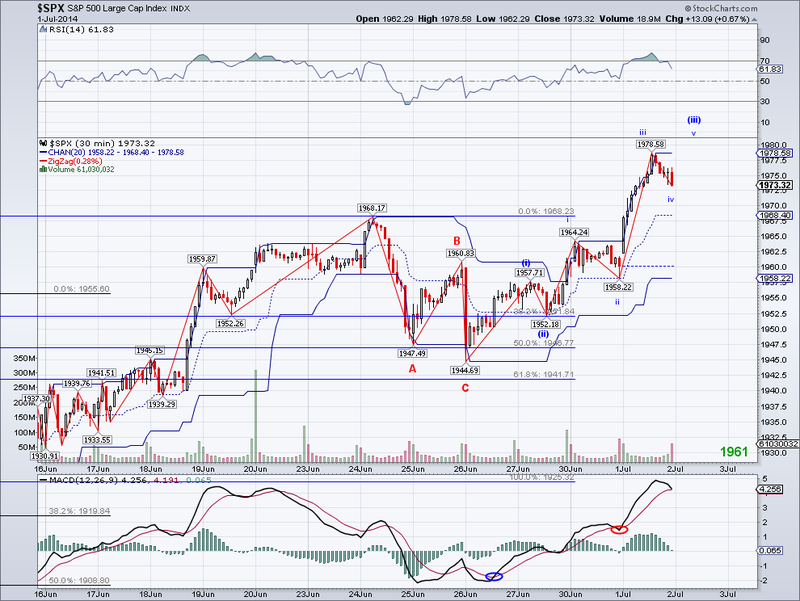 If we see further selling, the market might find a bottom at that level and rally to form a right shoulder. This pattern would provide good short term opportunities for longs and shorts, so I'll be keeping an eye on it. Also, I saw Goldman Sachs issued a warning of a temporary sell off in stocks in the next 3 months due to the what has been happening in the bond market. The market hasn't had two consecutive bearish months in 2 years, and maybe we'll see one before the summer is over. I am holding on to Gold and hoping to see a follow thru rally next week. The market made a marginal new high today despite good earnings reports and a strong China PMI. 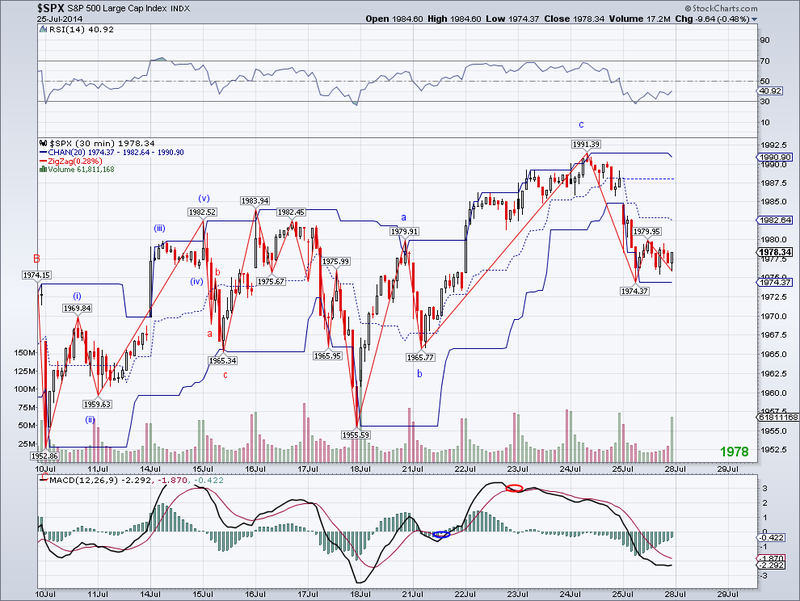 So I am assuming a 3rd wave peaked and we will see consolidation before another wave that should go past 2000. 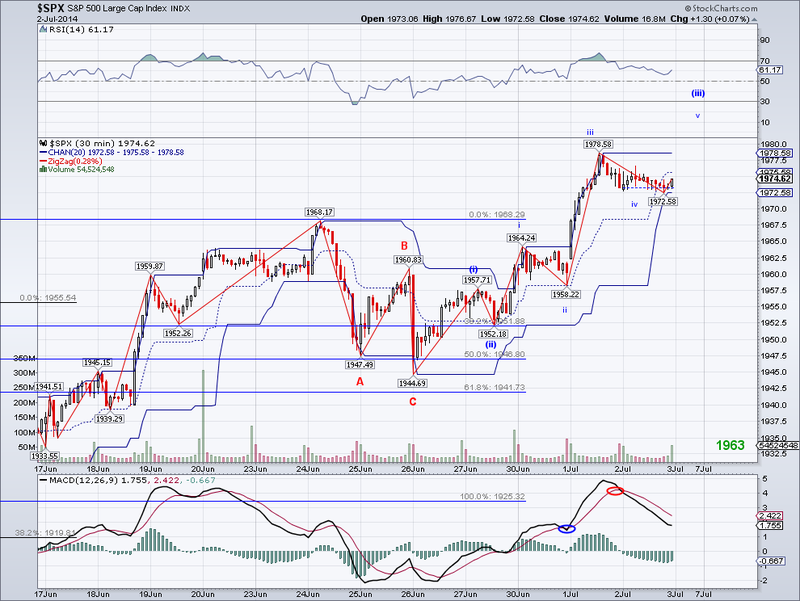 This 3rd wave on the micro count is about the same length as the 1st wave, which is shorter than usual for a W3. So we'll see if we get an extension on the 5th? 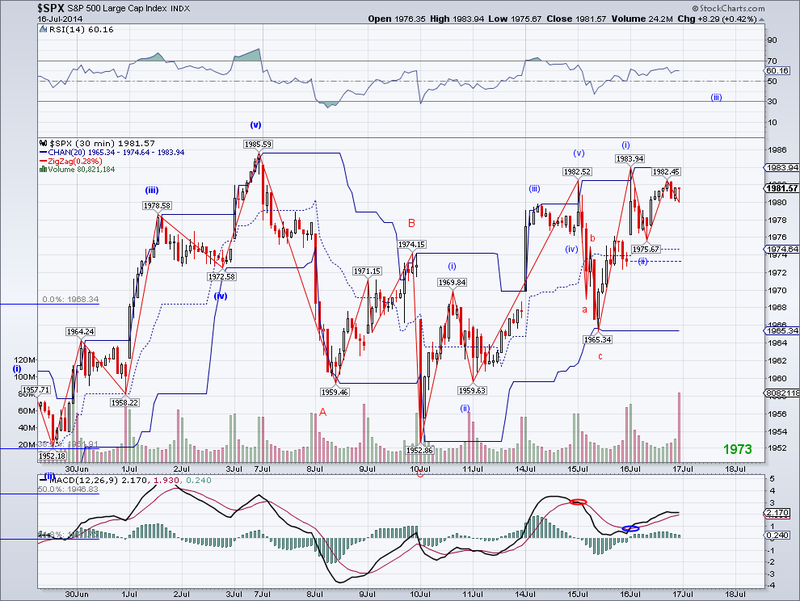 For the micro count to be valid, 1979.91 can not be breached or else it will signal a deeper correction. My gold position did not do too well today but it is still within a bullish pattern, so we'll see.. The market continued marching higher today thanks to the tech sector and the count on the SP500 is starting to look like a bullish 5 wave count. If this is the correct count, then we're looking at 2015-2020 as the initial target. Considering there will be lots of earning reports tomorrow, this might just be the excuse to blow past 2000. Also, if China reports a good PMI tonight, it will set the tone for a worldwide rally so we'll see how the numbers look in a few hours. I am up to my neck in Chinese shares on my long term portfolio, so I hope PMI numbers will come above expectations. Lastly, I bought back Gold today as I see a potential for a multi-month rally if lows hold. Time for Gold to shine again. Another all time high was reached today by the SP500 and the Trend Average has turned green again. However, I still see the possibility of the second shoulder at the 1965 level before any meaningful rally. The waves in the last few weeks have been choppy while the daily MACD has been resetting, which normally points to a consolidation period. One could argue for a flat correction or a sideways correction at this point, so a break out of the trading range puts the market easily over the 2010 level. Even if the market breaks some of its most recent support levels, it would still be bullish given the fact that bears have not really been able to make a dent in this rally. I can't really imagine the market continuing to rally until December but as I've always said, the trend is your friend. I am in cash on my trading account as the market didn't test the 1965 level so my game plan is the same as yesterday. The market started the day on the bearish side but it bounced right off the 1965 level to close just above the Trend Average, which will possibly turn bullish if the market manages to trade above it tomorrow. There is the possibility of a Double Shoulder Inverted H&S, so if we see the market bounce off 1965 again, chances are we will see a break out rally. 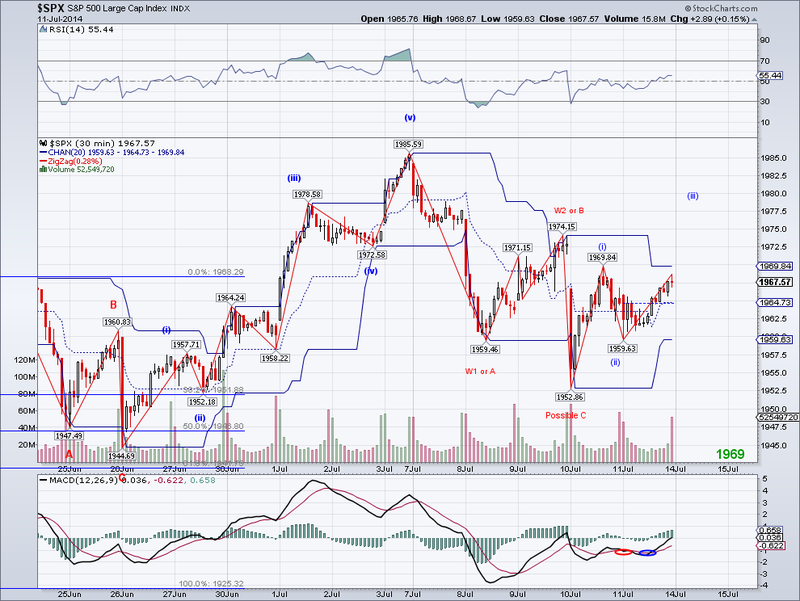 A potentially profitable set up is to buy at 1966 with a stop at 1958, with the upside potential of 2005. I sold Gold today to lock in profits and I will either buy the market if we see support tested again or buy gold at the test of its 50 DMA. The market was able to hold the low from yesterday in the cash market and had a strong rebound today closing comfortably above the Trend Average. 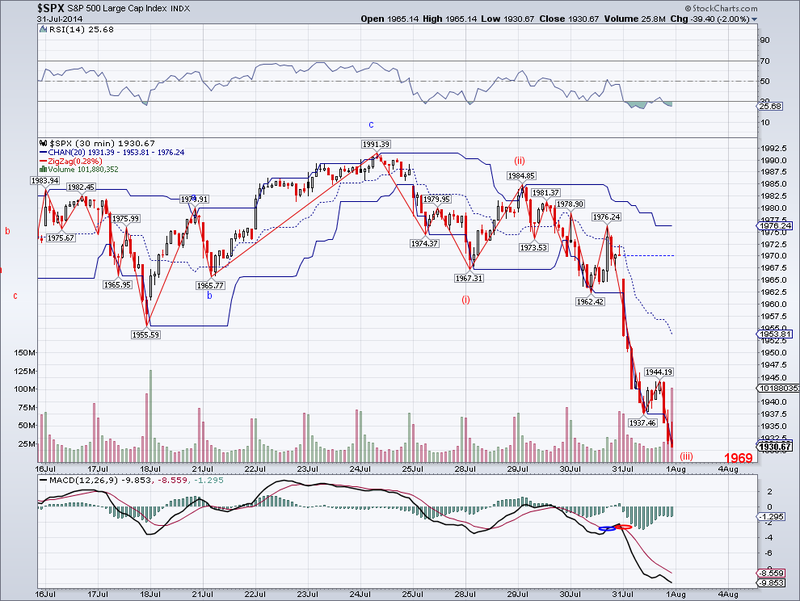 So it is too early to tell just what general direction the market is going in the next few weeks. If the bulls manage to break the all time high, then the TA will change to the bullish side again and more upside will come. But if the market fails to reach a high and goes back below the TA, then lower lows will come and maybe we'll finally see the correction many of us have been waiting for. There are different ways to label the waves but for the sake of simplicity, I rather leave them without labels until something more clear and predictable appears. Until then, I think it's best to be cautious. I am holding on to Gold in hopes of another bullish wave to come early next week. The market failed to follow through on the bullish micro count I had labeled yesterday and instead sold off to turn the Trend Average bearish. The one thing that remains bullish is the fact the low today did not breach 1952.86, which must break if we are to see follow through selling. The cause for selling was the downing of the passenger plane over Ukraine, which could turn into a Geo-political mess given the fact this could be blamed directly on Russia. A market correction has been due for quite some time, but it is too early to tell if this is a major turning point. The Trend Average has not turned bearish since April, so perhaps bears will finally be able to profit at last! The gold position I bought did well today but I am not selling just yet. I raised my stops to just above break even as I expect further upside. 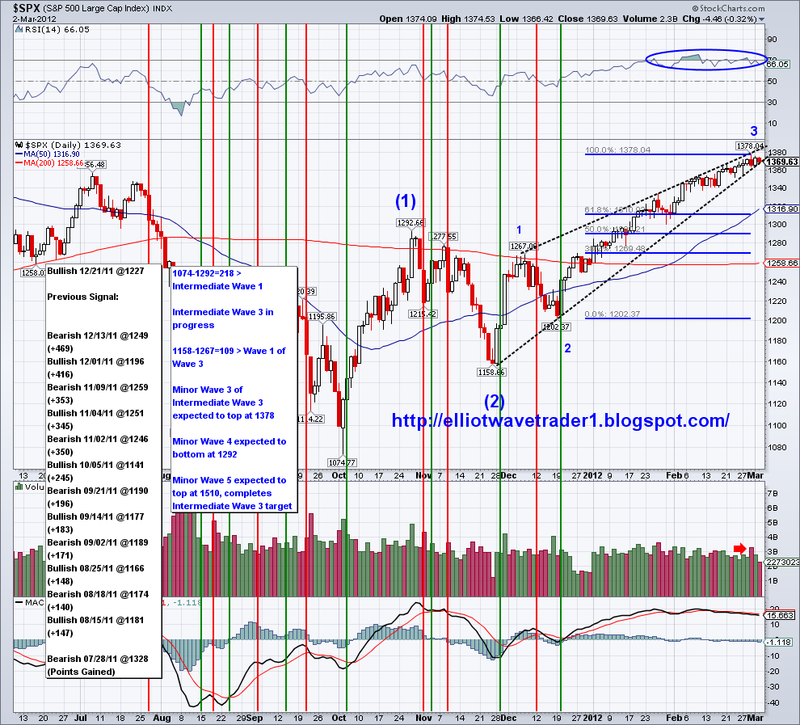 The market action today confirms the move yesterday as another abc and the bullish wave today could be the start of another bullish 5 count that targets 2020. 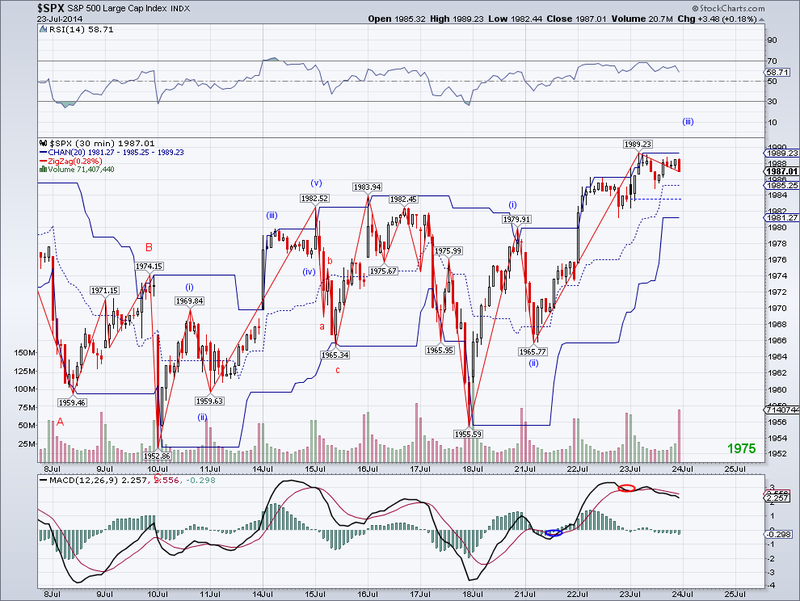 A break of the all time high would confirm this count and implies a break out wave as soon as tomorrow. 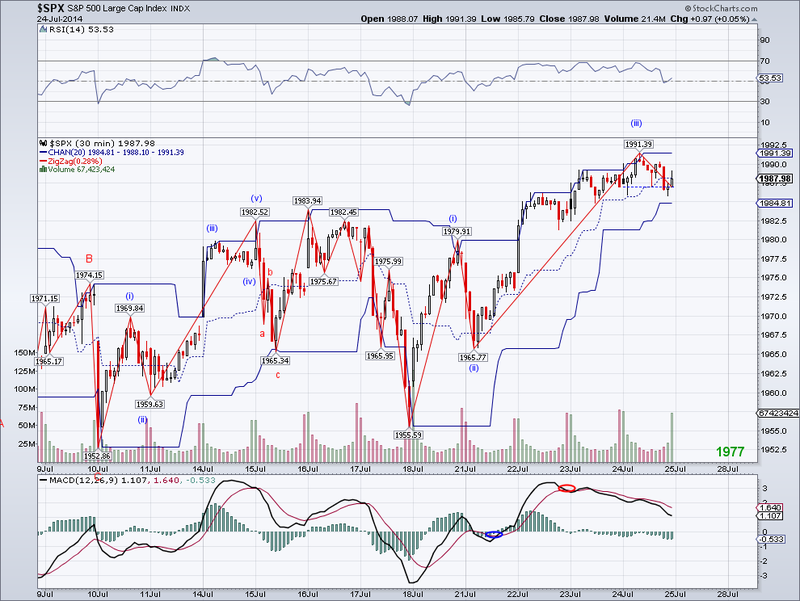 The Dow closed at an all time high so it might continue to lead the SP500 to higher highs. At this point, all major economies seem to be growing moderately and that supports corporate profits. The big question is how fast are earnings growing, the healthier they look, the higher the market will go. I ended up buying some gold today because of its pattern, so hopefully it'll bounce in the next few days. The market managed to put in a 5th wave on the micro count in the morning before reversing in what seems so far like an abc move (it turns into a bearish 5 count if the market gaps down tomorrow). What I don't like about the bullish 5 wave micro count is that it fell short of the target I had, so it could arguably be another zig zag for an X wave. But since the market closed above its Trend Average, I am assuming the market will continue to go up until it finally gets exhausted. Earnings are starting to come in, so they should provide the excuse for another substantial rally or the beginning of a big correction. I am cash waiting for an opportunity but I am keeping an eye on metals and oil as they have sold off in the last couple of days and might bounce hard once they find a bottom. The market has followed the micro count posted, so we can assume for now the bearish wave to 1959 was a C wave and now we are seeing a 5 wave count that will possibly end up challenging 2000 (specially since the DJI made an intraday all time high). How this micro count fits into the Intermediate picture is open to debate, but I still think the market will correct in the next few weeks. 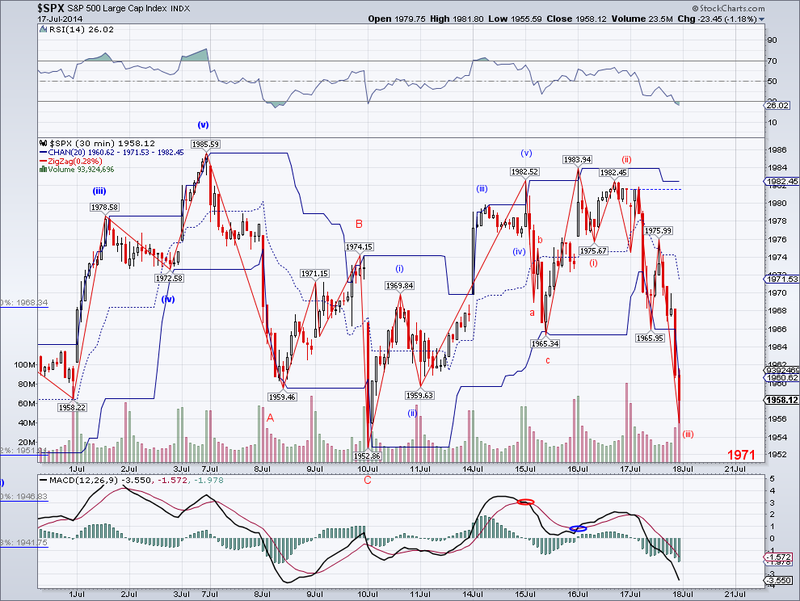 Perhaps earnings will be the excuse for the correction? 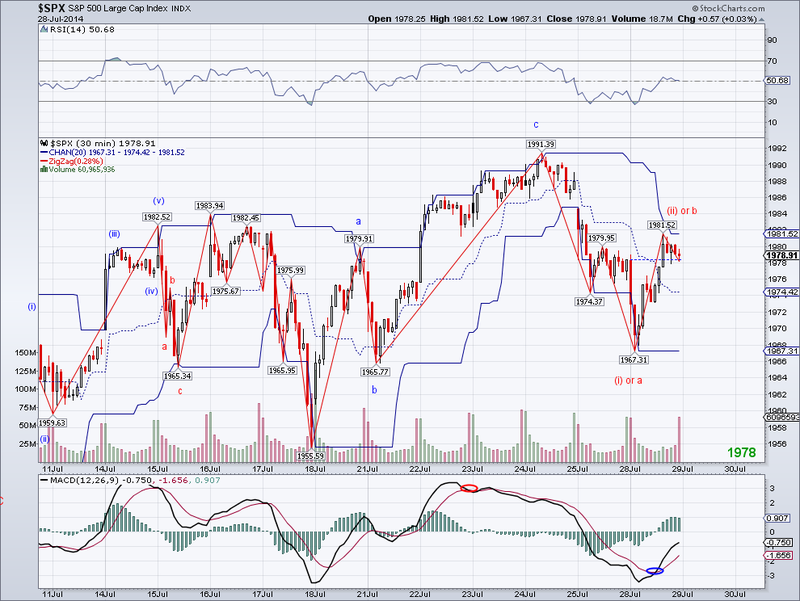 I will probably buy back volatility at the end of 5 waves on the micro count. Now that the WC is over, I can get back on a more normal schedule. Congratulations to Germany for winning the WC, they have a great team. My prediction of Argentina winning almost came true a few times but luck was not on their side. Still, Argentina had the right tactic to win as they were able to hold Germany scoreless during regulation time while producing several clear chances to score but failed to capitalize (the one they did score did not count). Which in itself was a significant achievement considering this was the second highest scoring German team in WC history, and which pushed Germany into the all time leading scoring country of the tournament. Maybe in 2018 I'll be able to go to Russia for the WC if the markets cooperate..lol. I wonder what the S&P 500 will be at that time.. maybe 3000? The market closed again below the Trend Average after briefly testing and we should get a decisive move early next week. 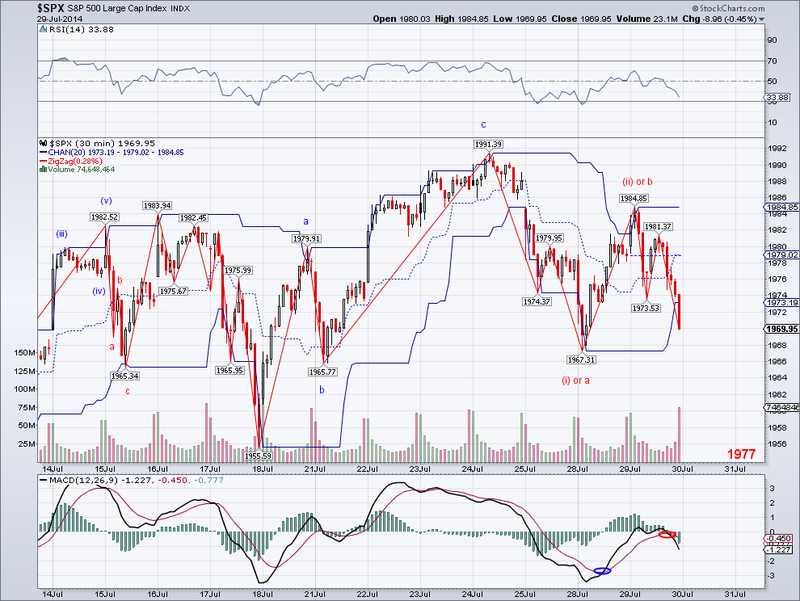 If the wave from yesterday was a C, we could see a 5 wave count that will challenge 2000 next week. But if the wave is a subdivision of a W3, then we will see a substantial sell off starting Monday so it's toss up at this point. I am staying in cash until I see a better pattern to trade, plus I want to watch the World Cup this weekend stress free. It's too bad the WC is ending as I enjoyed the competition but is good in the sense that I can concentrate on stuff I've been postponing to watch the games. 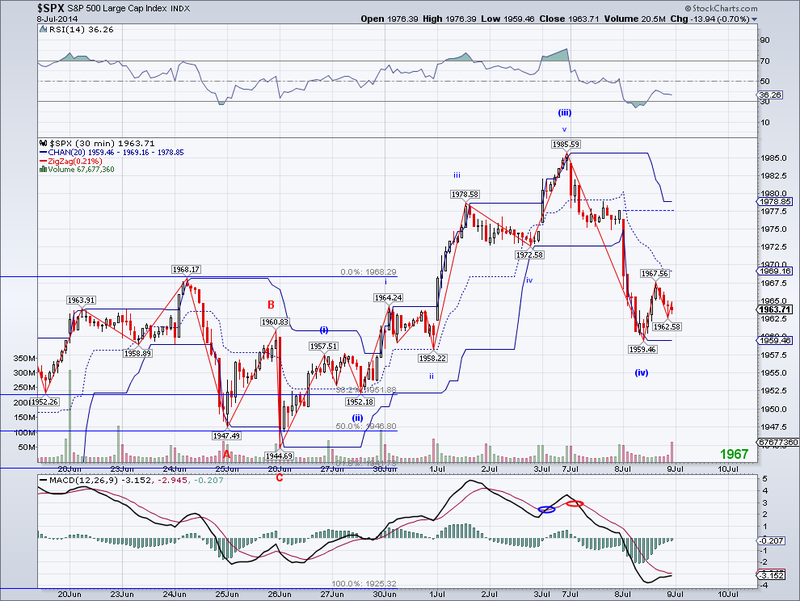 The count I was tracking was invalidated with today's gap down as 1957 was the lowest the W4 could go. 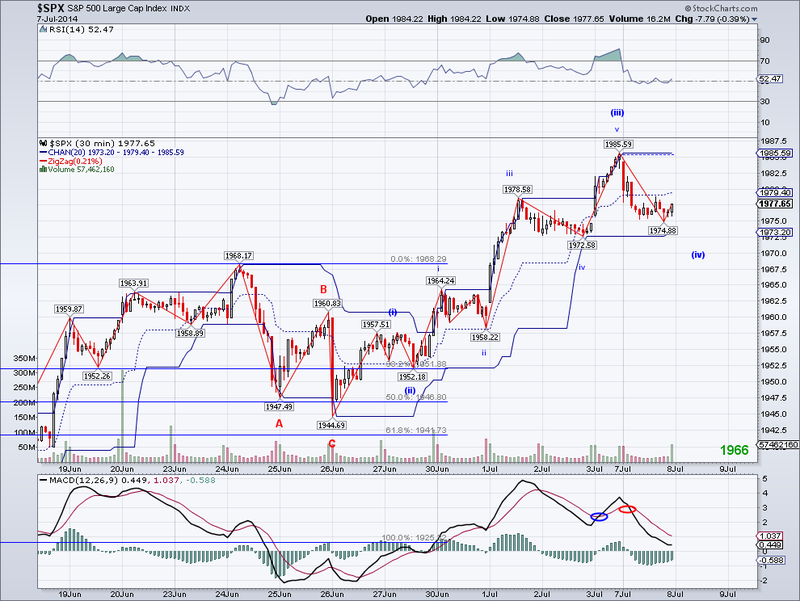 So I relabeled the previous bullish wave as a complete structure, and I am assuming this move is either a bearish 5 wave count to 1920 or an ABC correction that must not go below 1944. The daily MACD has turned bearish again, but this is the third time it has done so in the last couple of months only to get whipsawed. Normally, the bearish MACD turn allows the market to test the 50 DMA but I won't be betting on it until I see 1944 get taken out. The excuse for the sell off was Portugal but I get the feeling no one will remember Portugal in a few months time, as we've been thru this enough times already.. anyone remember Cyprus? I am in cash and waiting. The market bounced as expected but I will be looking at the W4 invalidation level I mentioned yesterday to see if it holds on the pullback. If the market manages to maintain closes above the Trend Average, we should see the all time high challenged this week or earlier next week. The earnings season might be an excuse to lift the market past 2000, so be careful shorting above the TA. Also, I saw Marc Faber predicting a "crash" again today. So if we go by his impeccable timing since 2009, we're going to see another bullish leg soon.. lol. And too bad it won't be the original final in the WC I had wanted (BRA vs ARG), but at least ARG made it and I predict the cup goes back to South America on Sunday. Brazilians will be in pain to see ARG win in their country. There was finally some stronger selling today, after weeks of rallying. The market closed before the Trend Average and failure to recapture the trend could mean a bigger correction is coming. 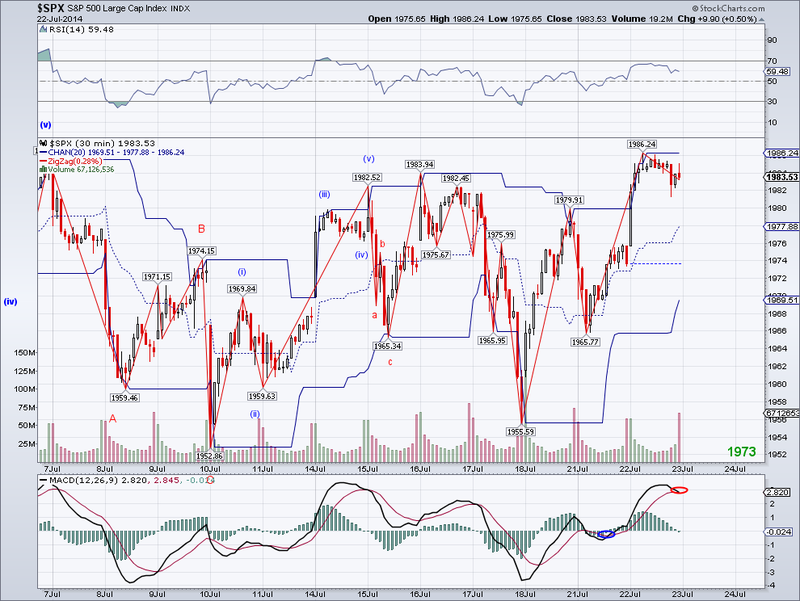 With that said, the market is still in a W4 as long as 1957.51 holds. So if support holds, then expect a challenge to the all time high. Maybe the market tops after the World Cup is over? And now the World Cup.. I'm still shocked at Brazil's loss (Germans were merciless! ! ). I knew the game today was going to tough without their top scorer and their captain but not this. This was a historical game and one that I will always remember. It's almost like waking up and seeing the market drop 1000 points overnight.. so I guess it will be Deutschland and Argentina (which I think ARG will win). I was really hoping to see an all South American final but I guess it won't be happening anytime in the next 10 or 20 years..
Hope everyone had a good long weekend. I was going to update last Thursday but since it was half a session and the market followed the count, I figured it would be best to update today. 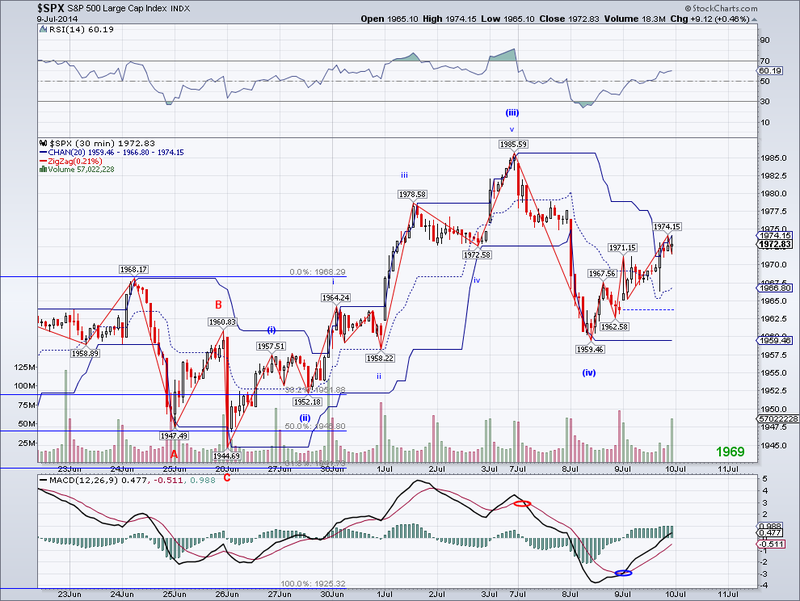 So basically, the count within the W3 that I saw possibly topping at 1987 (came close enough at 1985) is finished. And the reversal today is likely to be the W4, which could develop into a flat or a zig zag before launching one final wave to a new all time high. It's hard to tell if this count supports a test of 2000 but it looks possible given the euphoric sentiment and the lack of fear. I ended up buying volatility on Thursday but I closed the position today already. I think the market will be turning south sooner rather than later. 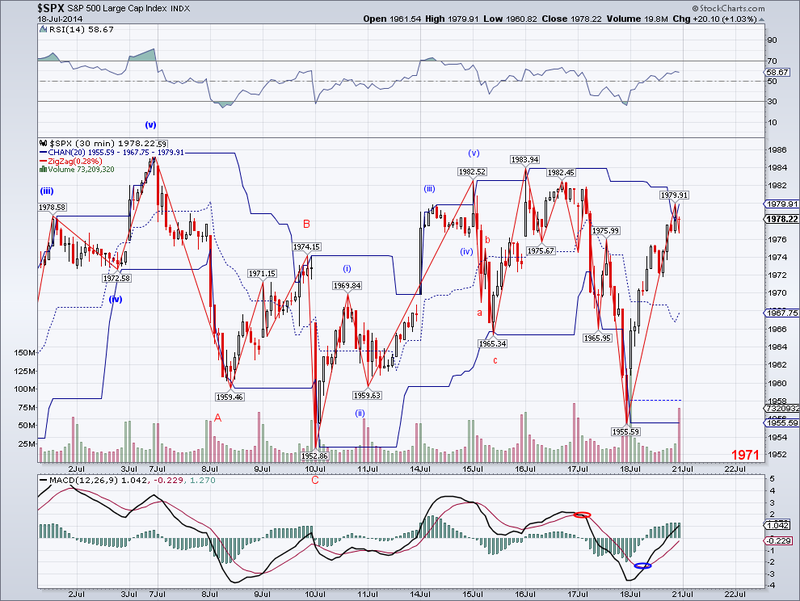 But with earnings coming up, maybe we'll get to some ridiculously high number before finally getting a correction. 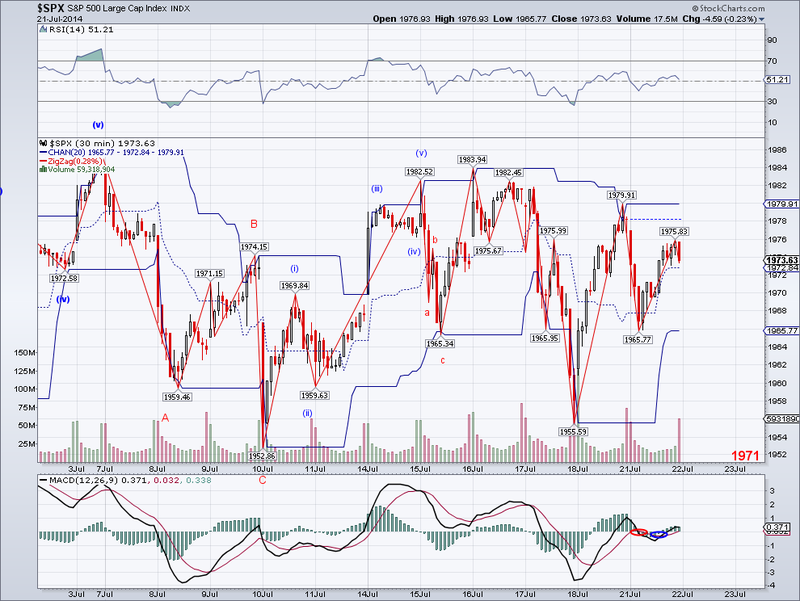 The wave today fits the count perfectly, so we could see a rally tomorrow (because of the jobs reports?) to the mid 1980's level. The number I like in particular is 1987, so the market hits that, I'll buy back the volatility I sold the other day or even go short in expectation of a bearish wave to the Trend Average. I read this bull market is now the 5th longest ever at just over 1,000 days, so a bearish turn around could come soon. At the same time, the longest bull market ever was in the 90's and lasted about 2,500 days. These are times when the trend is your friend :) I think I have a better chance of calling the winner for the World Cup (I am predicting Argentina) than pinning down the long term top for this market. 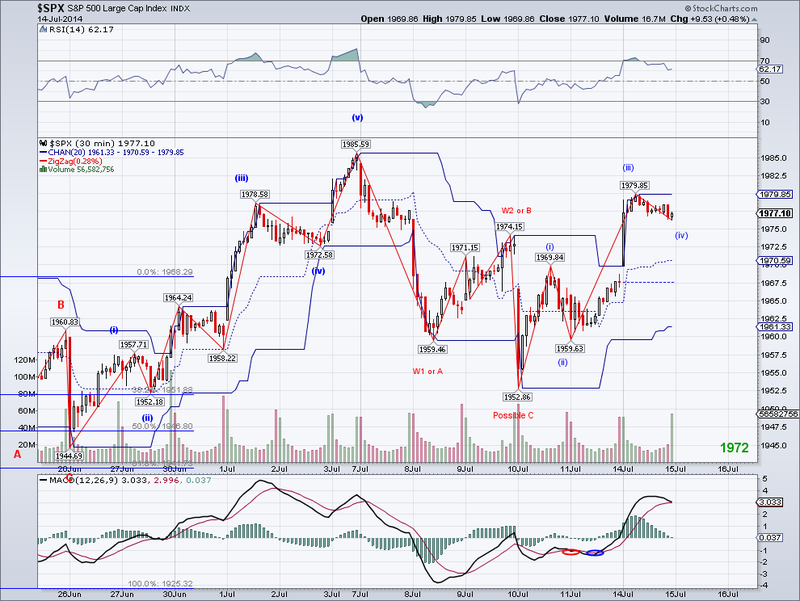 The bullish wave finally came and the count has already reached its original target of 1975-1980 posted on Friday. However, since the W3 is subdividing, chances are this impulse is not done so I am expecting more highs in the next few days. How this impulse fits into the overall Intermediate count is open to debate but I assume a significant top is on the horizon, as in the next few weeks. In the meantime, it's best to just stay with the trend to either stay long and enjoy gains or avoid being short.